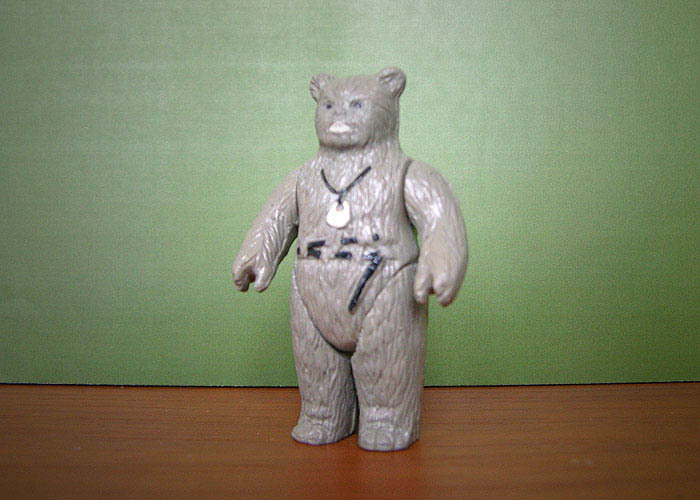 Pictured here is a hand-painted Top Toys Chief Chirpa (Osito Ewok) hardcopy. Painted hardcopies like this one, known as paint masters, would have been used for a variety of purposes including photography, samples for trade shows like Toy Fair, or examples of color scheme for foreign vendors. This particular one was created in-house at Top Toys and probably used to test the color matching capabilties for this particular figure to match the US and other foreign licensed paint decos. If you look at the next photo you can see that this foreign hardcopy is held together by metal pins as most domestic harcopies would have been, though these pins are a bit thicker than the style used domestically. The legs have not been removed because they are glued in place. As expected, the figure is a bit heavier than a Kenner production figure. 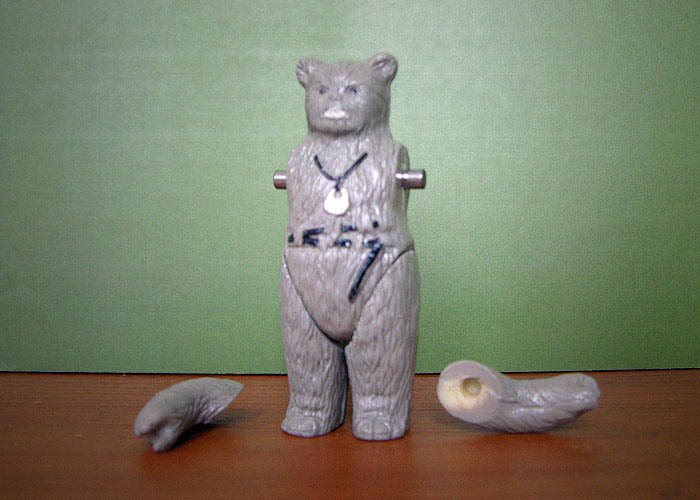 The casting material can be seen on the inside of the arms. It appears to be a whitish color. Top Toys hardcopies have turned up in both green and black urethane also. Because of the way this hardcopy was created it is slightly smaller than a Kenner production figure. 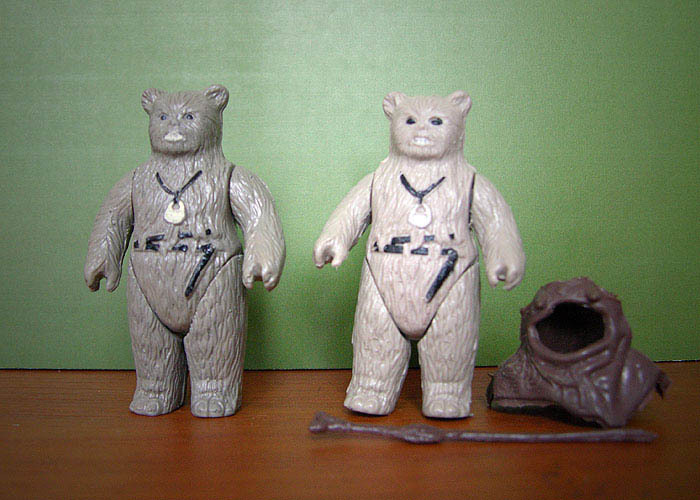 Top Toys basically used Kenner production figures as the sculpt stage in creating a hardcopy. As a result of this the Top Toys figures are a bit smaller than their Kenner counterparts. 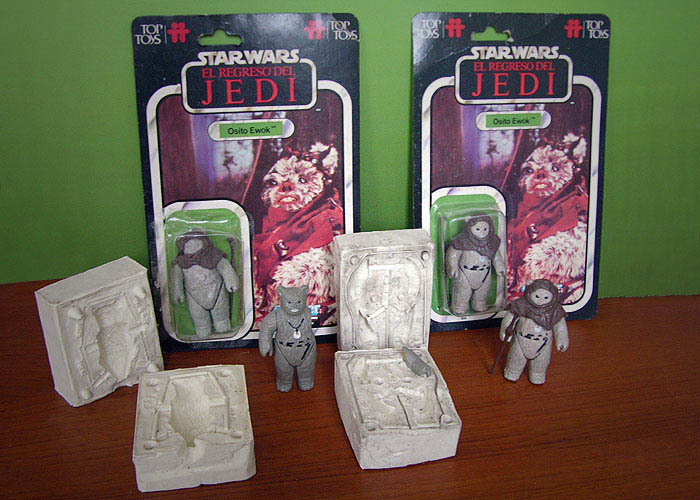 Due to cost, Top Toys chose to make their own molds for their star Wars figures, rather than pay Kenner for molds. Top Toys was a company already manufacturing toys, so they had molding capabilities. For a while there was much speculation as to why Top Toys would even have to create thier own hardcopies but the answer is quite simple really. When a production mold is cut a machine called a pantograph traces the contours of a hardcopy and cuts the mold. A production figure would have been much too soft for the stylus to work, thus a hardcopy would have had to have been made for tooling purposes. An example of this method being used domestically would be the hardcopies cast from production figures to create the TRU Classic 4 pack in the mid 1990's. The next image is a great side by side comparison shot between the hardcopy (left) and a production Top Toys Chripa (right). Take note to how much darker the hardcopy was painted. The next shot shows the feet of both figures. Like all hardcopies the figure lacks both foot holes and copyrights. An interesting aspect of Top Toys figures is that the production figures also lack these details. Sadly, this hardcopy has sustained some damage. This can be seen on both feet and in the crotch area. I'm told there is a pretty big crack in the crotch which can be seen as the dark spot that appears to be a shadow. The crotch would have been where the gate was located in the silcone mold. It's possible this happened during removal from the mold. If this example were to only be used as a paint master there would have been no need for a better one. 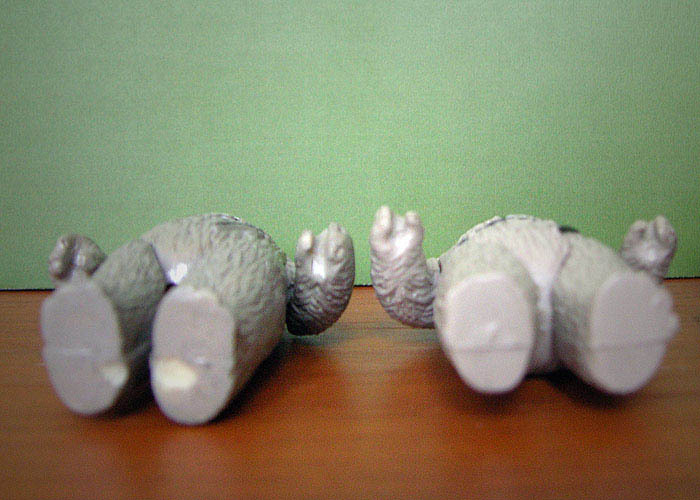 It's also possible it happened at a later date and somebody at Top Toys glued the legs on because of the crack. The final image shows the run Mattias has assempled for this figure. Pieces in the run include the Top Toys painted hardcopy, head/torso and limb molds, a carded sample, a carded production figure, and a loose production figure. I'd like to thank Mattias for sharing this amazing run.